Background: This study aimed to perform a bibliometric analysis of Randomized Controlled trials (RCTs) published in palliative care journals. Settings and Design: Systematic review of palliative care journals. Materials and Methods: MEDLINE database was searched for journals with name 'palliative' in their title, and articles published from January 2007 - December 2011 were then searched in individual journals with search limits activated for 'randomized controlled trials.' The reporting rates of all journals were compared. The selected articles were categorized into practice, education, research, and administration (PERA). The articles were also grouped under participants, interventions, comparisons, and outcomes (PICO) format for analysis. Quality scoring of RCTs was done using Jadad scale. Statistical Analysis: Quality scores were compared between journals and article categories (PERA, PICO) using one-way ANOVA with Bonferonni test, Chi-square test were done at 95% confidence interval using SPSS for Windows version 16.0. Results: The overall reporting rate of RCTs in palliative care journals was 1.04%, and the overall RCTs' quality score was 2.8.99 out of a total score of 5 on Jadad scale. PSC had the highest reporting rate of 3.27% (8/244) followed by JPC at 1.53% (3/196) and PM at 1.353% (8/591). The RCTs in IJPN had the highest quality score at 3, followed by AJHPC (3 ± 1) and JPPCP (3 ± 2.82). Significant association was found between cancer patients as study population and practice as RCT category. Comparison between PERA and PICO categories for quality of RCTs was not significant (P > 0.05). Conclusions: The 12 palliative care journals analyzed in this study published few RCTs at a five-year reporting rate of 1.04%, with Palliat Support Care having the highest reporting rate. Overall quality of the RCTs was moderate-low category. Randomized controlled trial (RCT) is a study in which participants are randomly (i.e. by chance) assigned to one of two or more treatment arms of a clinical trial. The first RCT on palliative care in MEDLINE was the study done by Wolfer and Visintainer  on pediatric surgical patients and parents' stress responses and the role of nursing care on psychological preparation and ever since then, there has been a steady increase in number of RCTs in all fields of care. Previously published studies on analysis of palliative care journals were on reporting of moral problems (ethical issues),  euthanasia,  chaplains and community-based clergy,  and, religion and spirituality,  cancer pain,  and pediatric palliative care. Since such a quantitative and qualitative analysis of RCTs was not previously performed in palliative care journals, the objective of this study was to perform a systematic review of reporting randomized trials in palliative care journals. MEDLINE database was searched for journals with name 'palliative' in their title, and articles published from January 2007-December 2011 were then searched in individual journals using search limits activated for 'randomized controlled trial.' The search strategy used in this study was earlier described by Jadad and McQuay  to have had a search sensitivity of 87%. The total number of articles in all the selected journals was taken as N. The number of included articles (N 1 ) based on search criteria were compared with total number of published articles (N) to obtain reporting rates (N 1 /N%) for each journal. The journals were categorized broadly into multidisciplinary, medical, nursing, and other (social work) categories of palliative care journals. 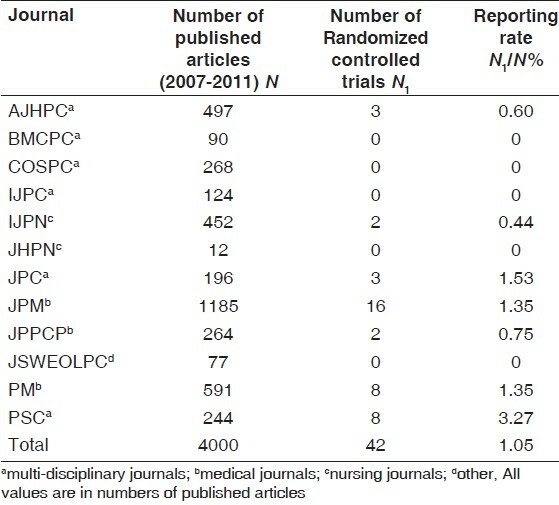 The number of RCTs published in proportion to the total number of articles published during the search period was calculated as the reporting rate for each journal. On the first level, the obtained articles were classified according to PERA model of practice, education, research, and administration. Since the included studies were RCTs and their critical appraisal during interpretation for evidence-based practice includes PICO (participants, interventions, comparisons, and outcomes) model, the four categories were sub-categorized subsequently. 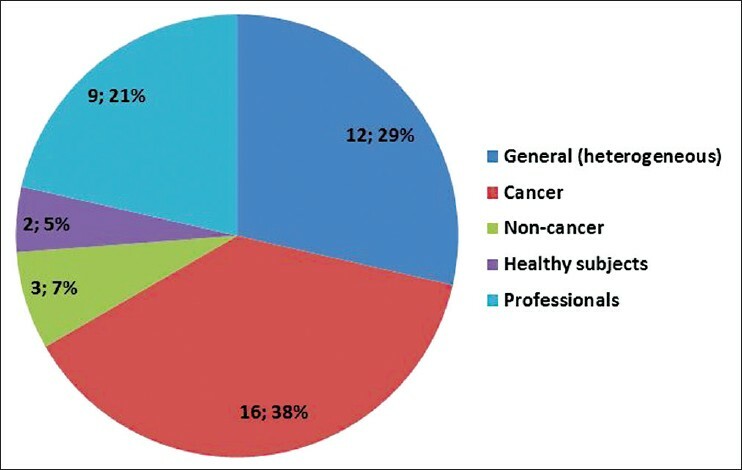 Participants or study population- heterogeneous (general or mixed) and homogeneous (patients as cancer and non-cancer; normal healthy subjects; and, healthcare professionals); Interventions- medical, surgical, complementary and alternative therapies, psychosocial methods and multidisciplinary treatments; Comparisons- control (no treatment), sham or placebo, similar treatments, standard care and combined interventions; Outcomes-subjective (patient-reported), objective (clinician-rated or measured), and mixed (both subjective and objective). 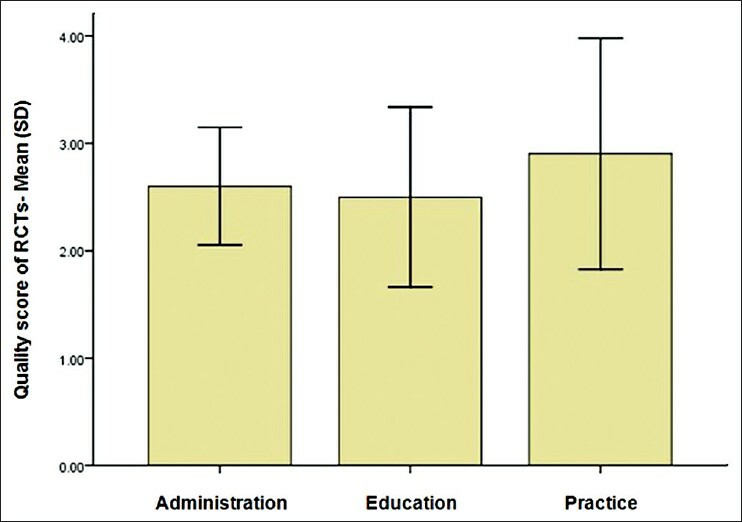 The reporting rates were compared between journals using Friedman's test. Categorical association between PERA and PICO types was done using Chi-square test. The quality scores were computed in means and standard deviations, which were compared between journals and PERA/PICO categories using one-way analysis of variance and post-hoc analysis using Bonferonni test. All analyzes were done at 95% confidence interval using SPSS version 16 for Windows (SPSS Inc, Chicago, IL). There were a total of 40, 10, 635 citations in PubMed, and of them, 86,847 were RCTs. The retrieved RCTs from palliative care journals were 52, and a final list of included RCTs was 42. Ten citations were excluded since 5 were not RCTs, 4 were secondary findings of RCTs, and 1 was about an RCT. Overall reporting rate of RCTs in all palliative care journals combined was 1.05% (42/4000). 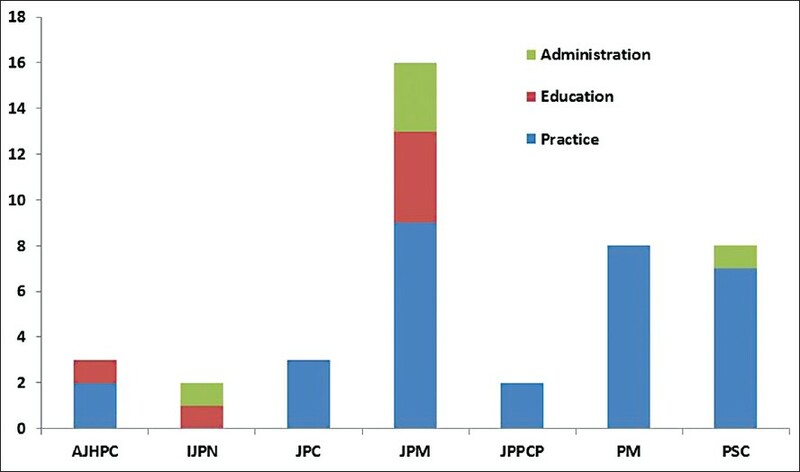 The 42 RCTs included 3 RCTs in AJHPC, 2 RCTs in IJPN, 3 in JPC, 16 in JPM, 2 in JPPCP, 8 in PM, and 8 in PSC. Of the 12 journals, PSC had the highest reporting rate of 3.27% (8/244) followed by JPC at 1.53% (3/196) and PM at 1.353% (8/591). Medical palliative care journals had the highest reporting rate at 1.24% (18/1449), followed by multidisciplinary journals at 0.67% (14/2087) and nursing journals at 0.43% (2/464). [Table 1] provides the comparison of palliative care journals on their reporting of RCTs, and [Figure 1] depicts the relative contribution from each journal. 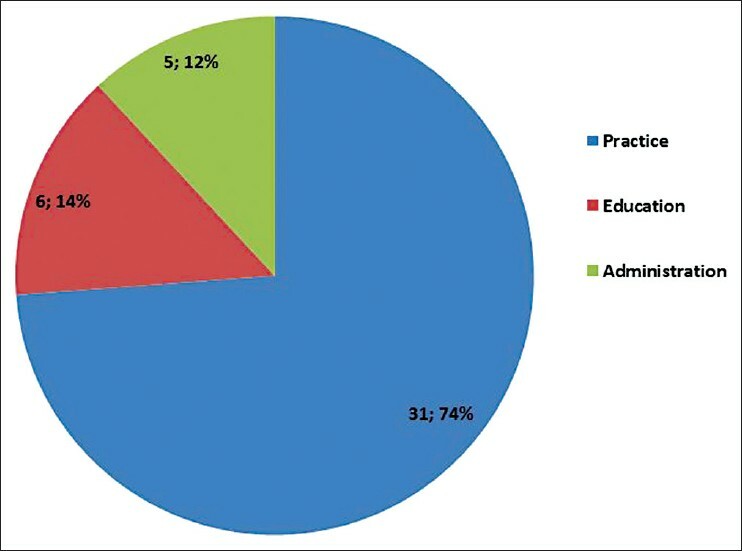 On PERA analysis [Figure 2], there were 31 RCTs on practice, ,,,,,,,,,,,,,,,,,,,,,,,,,,,,,,,,,,,,,,,,,,,,,,,,,,,,,,,,,,,,,,,,,,,,,,,,,,,, 6 RCTs on education, ,,,,, no RCTs on research, and 5 RCTs on administration. 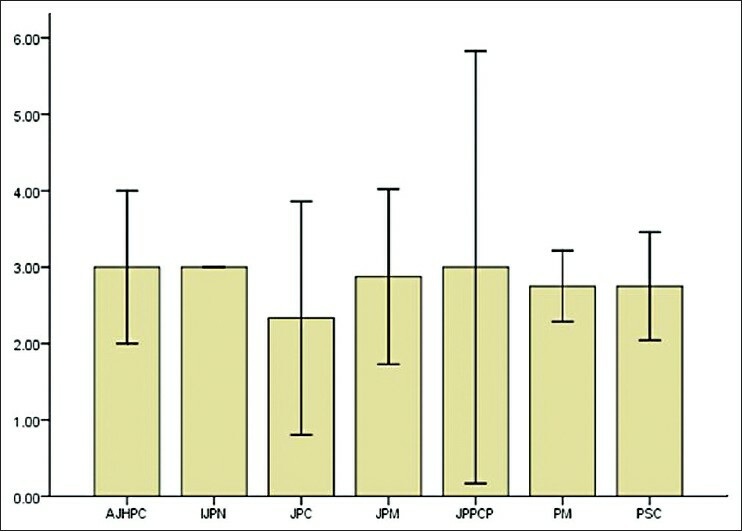 ,,,, [Figure 3] shows the comparison of journals for their reporting on PERA categories. 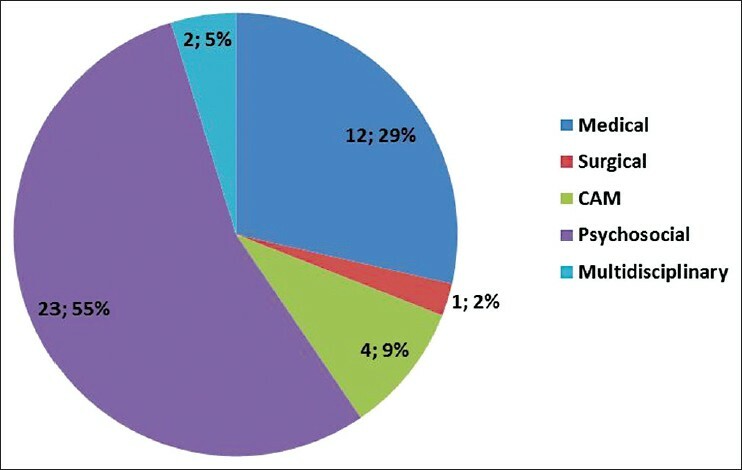 On PICO analysis, the sample populations included [Figure 4]: General (heterogeneous) population, ,,,,,,,,,,, cancer, ,,,,,,,,,,,,,,, non-cancer, ,, healthy subjects, , and healthcare providers; ,,,,,,, interventions included [Figure 5]: Medical, ,,,,,,,,,,,, surgical,  complementary and alternative treatments, ,,, psychosocial methods, ,,,,,,,,,,,,,,,,,,,,,,, and multidisciplinary interventions; , the comparison treatments were [Figure 6]: No-intervention controls, ,,,,,,,, sham or placebo, ,,,,, standard care, ,,,,,[ 78],,,,,,,, similar treatment ,,,,,,,, and combined interventions; ,,, and, the outcomes were [Figure 7]: subjective, ,,,,,,,,,,,,,,,,,,,,,,,,,, objective, ,,, and mixed. 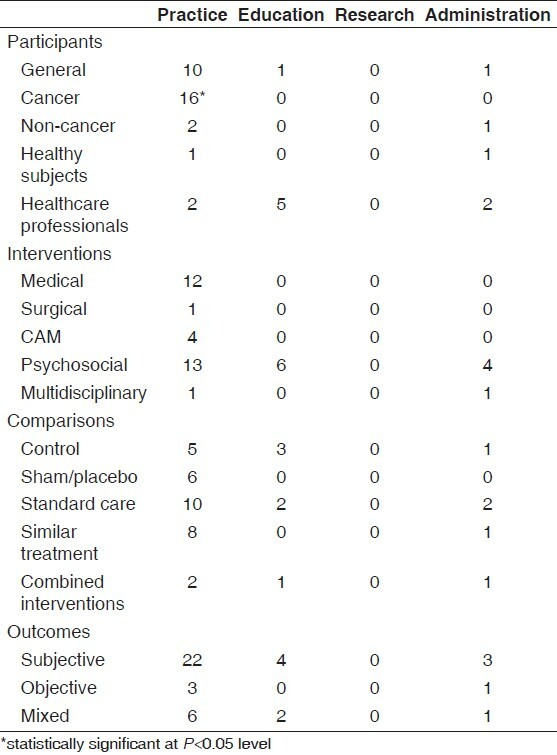 ,,,,,,,, Association between the PERA categories and PICO types in the included RCTs is shown in [Table 2]. Of the 4011792 citations in PubMed during the same search period, there were a total 1, 67, 408 citations indexed as 'clinical trial' in PubMed, and 87,011 were listed as 'randomized controlled trials' (a reporting rate of 2.16%). Considering that palliative care journals publish only a very minor percentage of RCTs at. 0048%, there is still a lot of scope for further improving the amount of reporting RCTs. Enhance the educational training of clinical scientists and research staff to ensure the highest standards of research conduct. Enhance the efficiency and cost-effectiveness of the clinical research oversight system. Most compellingly, justice would dictate that palliative treatments are effective, that futile or useless treatments are avoided and that patients are not party to "n of 1" trials by default. The overall reporting rate of RCTs in palliative care journals was 1.04%, and the overall RCTs' quality score was 2.8.99 out of a total score of 5 on Jadad scale. PSC had the highest reporting rate of 3.27% (8/244), followed by JPC at 1.53% (3/196) and PM at 1.353% (8/591). The RCTs in IJPN had the highest quality score at 3, followed by AJHPC (3 ± 1) and JPPCP (3 ± 2.82). 1. Clinical Trials, National Institutes of Health. Available from: http://Clinicaltrials.Gov/Ct2/Info/Glossary [Last accessed on 2012 Aug 19]. 2. Wolfer JA, Visintainer MA. Pediatric surgical patients′ and parents′ stress responses and adjustment as a function of psychologic preparation and stress-point nursing care. Nurs Res 1975;24:244-55. 3. Manchikanti L, Hirsch JA, Smith HS. Evidence-based medicine, systematic reviews, and guidelines in interventional pain management: Part 2: Randomized controlled trials. Pain Physician 2008;11:717-73. 4. Huwiler-Muntener K, Juni P, Junker C, Egger M. Quality of reporting of randomized trials as a measure of methodologic quality. JAMA 2002;287:2801-4. 5. Soares HP, Stephanie D, Kumar A, Clarke M, Scott C, Swann S, et al. Bad reporting does not mean bad methods for randomised trials: Observational study of randomised controlled trials performed by the Radiation Therapy Oncology Group. BMJ 2004;328:22. 6. Greenfield ML, Rosenberg AL, O′Reilly M, Shanks AM, Sliwinski MJ, Nauss MD. The quality of randomized controlled trials in major anesthesiology journals. Anesth Analg 2005;100:1759-64. 7. Tiruvoipati R, Balasubbramanian SP, Atturu G, Peek GJ, Ebourne D. Improving the quality of reporting randomized controlled trials in cardiothoracic surgery: The way forward. J Thorac Cardiovasc Surg 2006;132:233-40. 8. Klassen TP, Pham B, Lawson ML, Moher D. For randomized controlled trials, the quality of reports of complementary and alternative medicine was as good as reports of conventional medicine. J Clin Epidemiol. 2005;58:763-8. 9. Mimouni D, Pavlovsky L, Akerman L, David M, Mimouni FB. Trends in dermatology publications over the past 15 years. Am J Clin Dermatol 2010;11:55-8. 10. Langham J, Thompson E, Rowan K. Identification of randomized controlled trials from the emergency medicine literature: Comparison of hand searching versus MEDLINE searching. Ann Emerg Med 1999;34:25-34. 11. Rios LP, Odueyungbo A, Moitri MO, Rahman MO, Thabane L. Quality of reporting on randomized controlled trials in general endocrinology literature. J Clin Endocrinol Metab 2008;93:3810-6. 12. Kiluk BD, Sugarman DE, Nich C, Gibbons CJ, Martino S, Rounsaville BJ, et al. A methodological analysis of randomized clinical trials of computer-assisted therapies for psychiatric disorders: Toward improved standards for an emerging field. Am J Psychiatry 2011;168:790-9. 13. Sox HC, Helfand M, Grimshaw J, Dickersin K, Tovey D, Knottnerus JA, et al. Comparative effectiveness research: Challenges for medical journals. Cochrane Database Syst Rev 2010;8:ED000003. 14. Strippoli GF, Craig JC, Schena FP. The Number, Quality, and Coverage of Randomized Controlled Trials in Nephrology. J Am Soc Nephrol 2004;15:411-9. 15. Dickinson K, Bunn F, Wentz R, Edwards P, Roberts I. 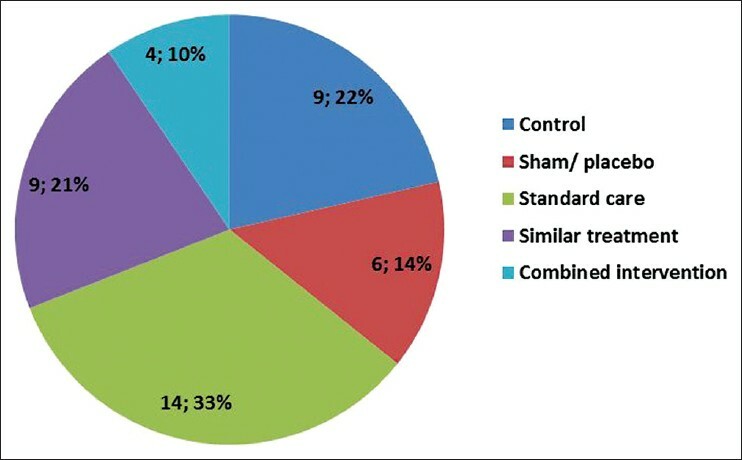 Size and quality of randomized controlled trials in head injury: Review of published studies. BMJ 2000;320:1308. 16. Schulz KF, Chalmers I, Grimes DA, Altman DG. Assessing the quality of randomization from reports of controlled trials published in obstetrics and gynecology journals. JAMA 1994;272:125-8. 17. You B, Gan HK, Pond G, Chen EX. Consistency in the Analysis and Reporting of Primary End Points in Oncology Randomized Controlled Trials From Registration to Publication: A Systematic Review. J Clin Oncol 2012;30:210-6. 18. Booth CM, Cescon DW, Wang L, Tannock IF, Krzyzanowska MK. Evolution of the randomized controlled trial in Oncology over three decades. J Clin Oncol 2008;26:5458-64. 19. Lai TY, Wong VW, Lam RF, Cheng AC, Lam DS, Leung GM. 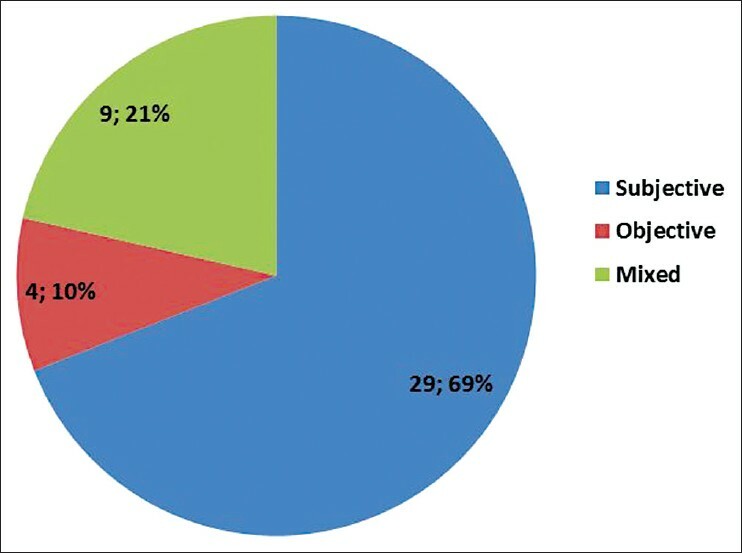 Quality of reporting of key methodological items of randomized controlled trials in clinical ophthalmic journals. Ophthalmic Epidemiol 2007;14:390-8. 20. Harrison JE. Clinical trials in orthodontics II: Assessment of the quality of reporting of clinical trials published in three orthodontic journals between 1989 and 1998. J Orthodontics 2003;30:309-15. 21. Robert IE, Hyde CJ, Bridgman SA. Orthopaedic fractures: Trends in randomised controlled trials. Injury 2001;32:779-82. 22. Achar P, Mitra I, Duvvi S, Kumar BN. Intention to treat analysis: How frequently is it used in ENT randomised controlled trials? Clin Otolaryngol 2010;35:65-7. 23. Tov AB, Lubetzky R, Mimouni FB, Alper A, Mandel D. Trends in neonatology and pediatrics publications over the past 12 years. Acta Paediatr 2007;9:1080-2. 24. Montenegro R, Needleman I, Moles D, Tnetti M. Quality of RCTs in Periodontology- a systematic review. J Dent Res 2002;81:866-70. 25. Boutron I, Estellat C, Guittet L, Dechartres A, Sackett DL, Hróbjartsson A, et al. 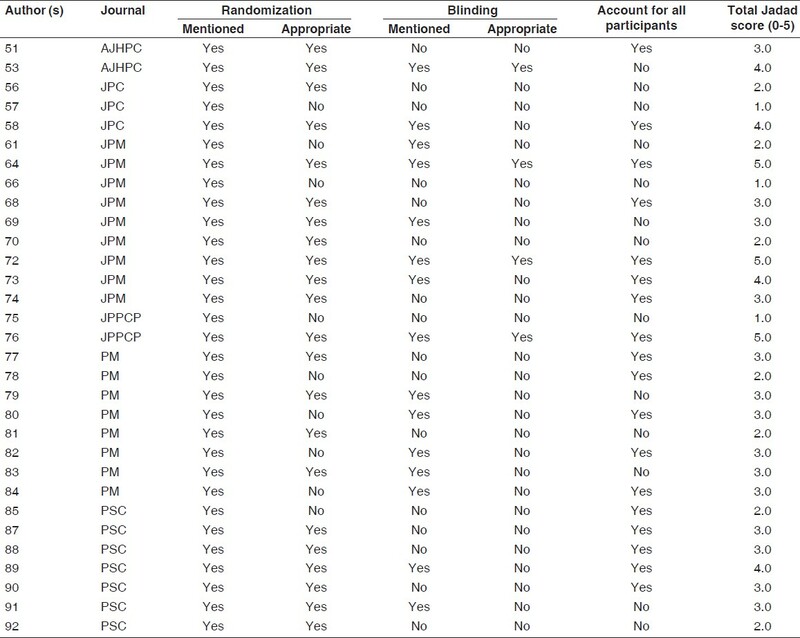 Methods of blinding in reports of randomized controlled trials assessing pharmacologic treatments: A systematic review. PLoS Med 2006;3:e425. 26. Dotson B, McManus KP, Zhao JJ, Whittaker P. Authorship and characteristics of articles in pharmacy journals: Changes over a 20-year interval. Ann Pharmacother 2011;45:357-63. 27. Gerber AJ, Kocsis JH, Milrod BL, Roose SP, Barber JP, Thase ME, et al. A quality-based review of randomized controlled trials of psychodynamic psychotherapy. Am J Psychiatry 2011;168:19-28. 28. Osrin D, Azad K, Fernandez A, Manandhar DS, Mwansambo CW, Tripathy P, et al. Ethical challenges in cluster randomized controlled trials: Experiences from public health interventions in Africa and Asia. Bull World Health Organ 2009;87:772-9. 29. Boutron I, Guittet L, Estellat C, Moher D, Hróbjartsson A, Ravaud P. Reporting methods of blinding in randomized trials assessing nonpharmacological treatments. PLoS Med 2007;4:e61. 30. Wang G, Mao B, Xiong ZY, Fan T, Chen XD, Wang L, et al. ; CONSORT Group for Traditional Chinese Medicine. 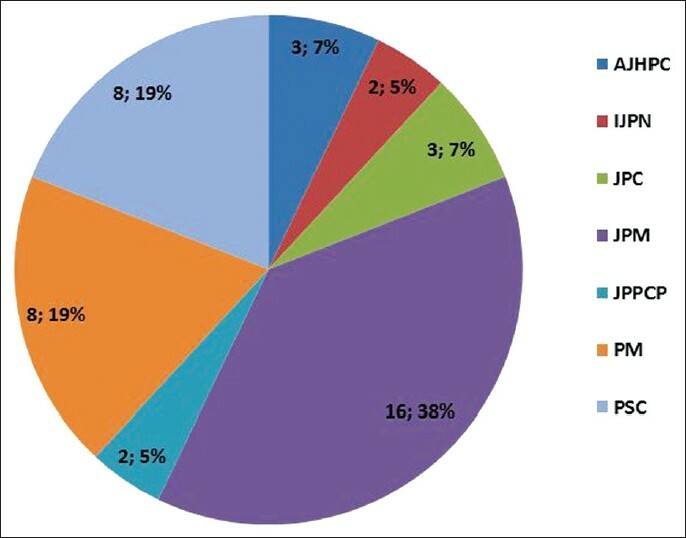 The quality of reporting of randomized controlled trials of traditional Chinese medicine: A survey of 13 randomly selected journals from mainland China. Clin Ther 2007;29:1456-67. 31. Leroy T, Christophe V, Penel N, Antoine P, Clisant S. Factual understanding of randomized clinical trials: A multicenter case-control study in cancer patients. Invest New Drugs 2011;29:700-5. 32. Joffe S, Cook EF, Cleary PD, Clark JW, Weeks JC. Quality of informed consent in cancer clinical trials: A cross-sectional survey. Lancet 2001;358:1772-7. 33. Vale C, Stewart L, Tierney J: Trends in UK cancer trials: Results from the UK Coordinating Committee for Cancer Res National Register of Cancer Trials. Br J Cancer 2005;92:811-4. 34. Liberati A, Himel HN, Chalmers TC. A quality assessment of randomized control trials of primary treatment of breast cancer. J Clin Oncol 1986;4:942-51. 35. Lai R, Chu R, Fraumeni M, Thabane L. Quality of Randomized Controlled Trials Reporting in the Primary Treatment of Brain Tumors. J Clin Oncol 2006;24:1136-44. 36. Nicolucci A, Grilli R, Alexanian AA, Apolone G, Torri V, Liberati A. Quality, evolution and clinical implications of randomized controlled trials on the treatment of lung cancer: A lost opportunity for meta-analysis. JAMA 1989;262:2101-7. 37. Breathnach OS, Freidlin B, Conley B, Green MR, Johnson DH, Gandara DR, et al. Twenty-two years of phase III trials for patients with advanced non-small-cell lung cancer: Sobering results. J Clin Oncol 2001;19:1734-42. 38. Ioannidis JP, Polycarpou A, Ntais C, Pavlidis N. Randomised trials comparing chemotherapy regimens for advanced non-small cell lung cancer: Biases and evolution over time. Eur J Cancer 2003;39:2278-87. 39. Machin D, Stenning SP, Parmar MK, Fayers PM, Girling DJ, Stephens RJ, et al. Thirty years of Medical Research Council randomized trials in solid tumours. Clin Oncol (R Coll Radiol) 1997;9:100-14. 40. Toulmonde M, Bellera C, Mathouline-Pelissier S, Debled M, Bui B, Italiano A. Quality of randomized controlled trials reporting in the Treatment of Sarcomas. J Clin Oncol 2011;29:1204-9. 41. Kober T, Trelle S, Engert A. Reporting of randomized controlled trials in Hodgkin Lymphoma in Biomedical Journals. J Natl Cancer Inst 2006;98:620-5. 42. Mathoulin-Pelissier S, Gougou-Bourgade S, Bonnetain F, Kramar A. Survival end point reporting in randomized cancer clinical trials: A review of major journals. J Clin Oncol 2008;26:3721-6. 43. Fowell A, Johnstone R, Finlay IG, Russell D, Russell IT. Design of trials with dying patients: A feasibility study of cluster randomisation versus randomised consent. Palliat Med 2006;20:799-804. 44. Hermsen MA, ten Have HA. Moral problems in palliative care journals. Palliat Med 2001;15:425-31. 45. Hermsen MA, ten Have HA. Euthanasia in palliative care journals. J Pain Symptom Manage 2002;23:517-25. 46. Flannelly KJ, Weaver AJ, Smith WJ, Oppenheimer JE. A systematic review on chaplains and community-based clergy in three palliative care journals: 1990-1999. Am J Hosp Palliat Care 2003;20:263-8. 47. Hermsen MA, ten Have HA. Pastoral care, spirituality, and religion in palliative care journals. Am J Hosp Palliat Care 2004;21:353-6. 48. Kumar SP. Reporting characteristics of cancer pain: A systematic review and quantitative analysis of research publications in palliative care journals. Indian J Palliat Care 2011;17:57-66. 49. Kumar SP. Reporting of pediatric palliative care: A systematic review and quantitative analysis of research publications in palliative care journals. Indian J Palliat Care 2011;17:175-82. 50. Jadad AR, McQuay HJ. A high-yield strategy to identify randomized controlled trials for systematic reviews. Online J Curr Clin Trials 1993;Doc No 33. 51. Homsi J, Walsh D, Lasheen W, Nelson KA, Rybicki LA, Bast J, et al. A comparative study of 2 sustained-release morphine preparations for pain in advanced cancer. Am J Hosp Palliat Care 2010;27:99-105. 52. Mercadante SL, Berchovich M, Casuccio A, Fulfaro F, Mangione S. A prospective randomized study of corticosteroids as adjuvant drugs to opioids in advanced cancer patients. Am J Hosp Palliat Care 2007;24:13-9. 53. Murray MA, Stacey D, Wilson KG, O′Connor AM. Skills training to support patients considering place of end-of-life care: A randomized control trial. J Palliat Care 2010;26:112-21. 54. Downey L, Diehr P, Standish LJ, Patrick DL, Kozak L, Fisher D, et al. Might massage or guided meditation provide "means to a better end"? Primary outcomes from an efficacy trial with patients at the end of life. J Palliat Care 2009;25:100-8. 55. Hansen MJ, Enright RD, Baskin TW, Klatt J. A palliative care intervention in forgiveness therapy for elderly terminally ill cancer patients. J Palliat Care 2009;25:51-60. 56. Volandes AE, Ferguson LA, Davis AD, Hull NC, Green MJ, Chang Y, et al. Assessing end-of-life preferences for advanced dementia in rural patients using an educational video: A randomized controlled trial. J Palliat Med 2011;14:169-77. 57. Vayne-Bossert P, Escher M, de Vautibault CG, Dulguerov P, Allal A, Desmeules J, et al. Effect of topical morphine (mouthwash) on oral pain due to chemotherapy- and/or radiotherapy-induced mucositis: A randomized double-blinded study. J Palliat Med 2010;13:125-8. 58. Steinhauser KE, Alexander SC, Byock IR, George LK, Olsen MK, Tulsky JA. Do preparation and life completion discussions improve functioning and quality of life in seriously ill patients? Pilot randomized control trial. J Palliat Med 2008;11:1234-40. 59. Horne-Thompson A, Grocke D. The effect of music therapy on anxiety in patients who are terminally ill. J Palliat Med 2008;11:582-90. 60. Watanabe S, Pereira J, Tarumi Y, Hanson J, Bruera E. A randomized double-blind crossover comparison of continuous and intermittent subcutaneous administration of opioid for cancer pain. J Palliat Med 2008;11:570-4. 61. Bruera E, Willey J, Cohen M, Palmer JL. Expressive writing in patients receiving palliative care: A feasibility study. J Palliat Med 2008;11:15-9. 62. Thomas JR, Yocum RC, Haller MF, von Gunten CF. Assessing the role of human recombinant hyaluronidase in gravity-driven subcutaneous hydration: The INFUSE-LR study. J Palliat Med 2007;10:1312-20. 63. Currow DC, Plummer J, Frith P, Abernethy AP. Can we predict which patients with refractory dyspnea will respond to opioids? J Palliat Med 2007;10:1031-6. 64. Rodriguez RF, Bravo LE, Castro F, Montoya O, Castillo JM, Castillo MP, et al. Incidence of weak opioids adverse events in the management of cancer pain: A double-blind comparative trial. J Palliat Med 2007;10:56-60. 65. Phillips W, Anderson A, Rosengreen M, Johnson J, Halpin J. Propofol versus propofol/ketamine for brief painful procedures in the emergency department: Clinical and bispectral index scale comparison. J Pain Palliat Care Pharmacother 2010;24:349-55. 66. Clark K, Currow DC, Agar M, Fazekas BS, Abernethy AP. A pilot phase II randomized, cross-over, double-blinded, controlled efficacy study of octreotide versus hyoscine hydrobromide for control of noisy breathing at the end-of-life. J Pain Palliat Care Pharmacother 2008;22:131-8. 67. Sampson EL, Jones L, Thuné-Boyle IC, Kukkastenvehmas R, King M, Leurent B, et al. Palliative assessment and advance care planning in severe dementia: An exploratory randomized controlled trial of a complex intervention. Palliat Med 2011;25:197-209. 68. Lennernäs B, Frank-Lissbrant I, Lennernäs H, Kälkner KM, Derrick R, Howell J. Sublingual administration of fentanyl to cancer patients is an effective treatment for breakthrough pain: Results from a randomized phase II study. Palliat Med 2010;24:286-93. 69. Lundorff LE, Jønsson BH, Sjøgren P. Modafinil for attentional and psychomotor dysfunction in advanced cancer: A double-blind, randomised, cross-over trial. Palliat Med 2009;23:731-8. 70. Mitchell GK, Del Mar CB, O′Rourke PK, Clavarino AM. Do case conferences between general practitioners and specialist palliative care services improve quality of life? A randomised controlled trial (ISRCTN 52269003). Palliat Med 2008;22:904-12. 71. Wilkinson S, Perry R, Blanchard K, Linsell L. Effectiveness of a three-day communication skills course in changing nurses′ communication skills with cancer/palliative care patients: A randomised controlled trial. Palliat Med 2008;22:365-75. 72. Perkins P, Vowler SL. Does acupressure help reduce nausea and vomiting in palliative care patients? Pilot study. Palliat Med 2008;22:193-4. 73. George R, Hephzibah J, John S. Does pamidronate enhance the analgesic effect of radiotherapy? A randomized trial. Palliat Med 2007;21:719-20. 74. Bruera E, Palmer JL, Pace E, Zhang K, Willey J, Strasser F, Bennett MI. A randomized, controlled trial of physician postures when breaking bad news to cancer patients. Palliat Med 2007;21:501-5. 75. Jones L, Harrington J, Barlow CA, Tookman A, Drake R, Barnes K, et al. Advance care planning in advanced cancer: Can it be achieved? An exploratory randomized patient preference trial of a care planning discussion. Palliat Support Care 2011;9:3-13. 76. Steinhauser KE, Alexander SC, Byock IR, George LK, Tulsky JA. Seriously ill patients′ discussions of preparation and life completion: An intervention to assist with transition at the end of life. Palliat Support Care 2009;7:393-404. 77. Thyme KE, Sundin EC, Wiberg B, Oster I, Aström S, Lindh J. Individual brief art therapy can be helpful for women with breast cancer: A randomized controlled clinical study. Palliat Support Care 2009;7:87-95. 78. Bakitas M, Lyons KD, Hegel MT, Balan S, Barnett KN, Brokaw FC, et al. The project ENABLE II randomized controlled trial to improve palliative care for rural patients with advanced cancer: Baseline findings, methodological challenges, and solutions. Palliat Support Care 2009;7:75-86. 79. Schulman-Green D, Ercolano E, Dowd M, Schwartz P, McCorkle R. Quality of life among women after surgery for ovarian cancer. Palliat Support Care 2008;6:239-47. 80. Lapid MI, Rummans TA, Brown PD, Frost MH, Johnson ME, Huschka MM, et al. Improving the quality of life of geriatric cancer patients with a structured multidisciplinary intervention: A randomized controlled trial. Palliat Support Care 2007;5:107-14. 81. Ringdal GI, Ringdal K, Jordhøy MS, Kaasa S. Does social support from family and friends work as a buffer against reactions to stressful life events such as terminal cancer? Palliat Support Care 2007;5:61-9. 82. Kruse BG, Melhado LW, Convertine L, Stecher J. Evaluating strategies for changing acute care nurses′ perceptions on end-of-life care. Am J Hosp Palliat Care 2008;25:389-97. 83. Cort E, Moorey S, Hotopf M, Kapari M, Monroe B, Hansford P. Palliative care nurses′ experiences of training in cognitive behaviour therapy and taking part in a randomized controlled trial. Int J Palliat Nurs 2009;15:290-8. 84. Meyers FJ, Carducci M, Loscalzo MJ, Linder J, Greasby T, Beckett LA. Effects of a problem-solving intervention (COPE) on quality of life for patients with advanced cancer on clinical trials and their caregivers: Simultaneous care educational intervention (SCEI):linking palliation and clinical trials. J Palliat Med 2011;14:465-73. 85. Claxton R, Marks S, Buranosky R, Rosielle D, Arnold RM. The educational impact of weekly e-mailed fast facts and concepts. J Palliat Med 2011;14:475-81. 86. Jacobsen J, Robinson E, Jackson VA, Meigs JB, Billings JA. Development of a cognitive model for advance care planning discussions: Results from a quality improvement initiative. J Palliat Med 2011;14:331-6. 87. Szmuilowicz E, el-Jawahri A, Chiappetta L, Kamdar M, Block S. Improving residents′ end-of-life communication skills with a short retreat: A randomized controlled trial. J Palliat Med 2010;13:439-52. 88. Galfin JM, Watkins ER, Harlow T. Evaluation of a training programme to teach a guided self-help psychological intervention to hospice staff. Int J Palliat Nurs 2011;17:119-24. 89. Lyon ME, Garvie PA, Briggs L, He J, McCarter R, D′Angelo LJ. Development, feasibility, and acceptability of the Family/Adolescent-Centered (FACE) Advance Care Planning intervention for adolescents with HIV. J Palliat Med 2009;12:363-72. 90. Allen RS, Hilgeman MM, Ege MA, Shuster JL Jr, Burgio LD. Legacy activities as interventions approaching the end of life. J Palliat Med 2008;11:1029-38. 91. Gade G, Venohr I, Conner D, McGrady K, Beane J, Richardson RH, et al. Impact of an inpatient palliative care team: A randomized control trial. J Palliat Med 2008;11:180-90. 92. Rushton CH, Sellers DE, Heller KS, Spring B, Dossey BM, Halifax J. Impact of a contemplative end-of-life training program: Being with dying. Palliat Support Care 2009;7:405-14. 93. Jadad AR, Moore RA, Carroll D, Jenkinson C, Reynolds DJ, Gavaghan DJ, et al. Assessing the qualsity of reports of randomized clinical trials: Is blinding necessary? Control Clin Trials 1996;17:1-12. 94. Olivo SA, Macedo LG, Gadotti C, Fuentes J, Stanton T, Magee DJ. Scales to assess the quality of randomized controlled trials- a systematic review. Phys Ther 2008;88:156-75. 95. Cohen E, Goldman RD, Ragone A, Uleryk E, Atenafu EG, Siddiqui U, et al. Child vs adult randomized controlled trials in specialist journals: A citation analysis of trends, 1985-2005. Arch Pediatr Adolesc Med 2010;164:283-8. 96. Cohen E, Uleryk E, Jasuja M, Parkin PC. An absence of pediatric randomized controlled trials in general medical journals, 1985-2004. J Clin Epidemiol 2007;60:118-23. 97. White IR, Horton NJ, Carpenter J, Pocock SJ. Strategy for intention to treat analysis in randomised trials with missing outcome data. BMJ 2011;342:d40. 98. Gravel J, Opatmy L, Shapiro S. The intention-to-treat approach in randomized controlled trials: Are authors saying what they do and doing what they say? Clin Trials 2007;4:350-6. 99. Henderson M, Addington-Hall JM, Hotopf M. The willingness of palliative care patients to participate in research. J Pain Symptom Manage 2005;29:116-8. 100. Ellis PM, Butow PN, Tattersall MH. Informing breast cancer patients about clinical trials: A randomized clinical trial of an educational booklet. Ann Oncol 2002;13:1414-23. 101. Ellis PM, Butow PN, Tattersall MH, Dunn SM, Houssami N. Randomized clinical trials in oncology: Understanding and attitudes predict willingness to participate. J Clin Oncol 2001;19:3554-61. 102. Addington-Hall J. Research sensitivities to palliative care patients. Eur J Cancer Care (Engl) 2002;11:220-4. 103. White CD, Hardy JR, Gilshenan KS, Charles MA, Pinkerton CR. Randomised controlled trials of palliative care: A survey of the views of advanced cancer patients and their relatives. Eur J Cancer 2008;44:1820-8. 104. White C, Hardy J. What do palliative care patients and their relatives think about research in palliative care? : A systematic review. Support Care Cancer 2010;18:905-11. 105. White C, Gilshenan K, Hardy J. 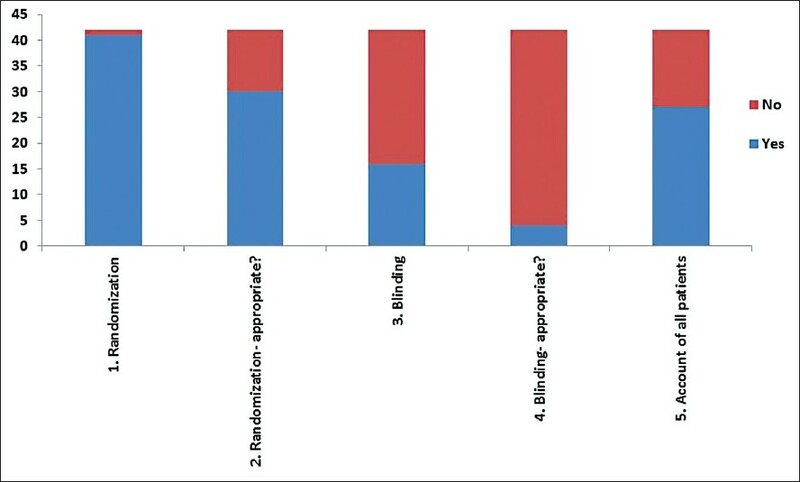 A survey of the views of palliative care healthcare professionals towards referring cancer patients to participate in randomized controlled trials in palliative care. Support Care Cancer 2008;16:1397-405. 106. Levy WC, Mozaffarian D, Linker DT, Kenyon KW, Cleland JG, Komajda M, et al. COMET Investigators. Years-needed-to-treat to add 1 year of life: A new metric to estimate treatment effects in randomized trials. Eur J Heart Fail 2009;11:256-63. 107. Begg C, Cho M, Eastwood S, Horton R, Moher D, Olkin I, et al. Improving the quality of reporting of randomized controlled trials: The CONSORT statement. JAMA 1996;276:637-9. 108. Moher D, Schulz KF, Altman DG, for the CONSORT Group. The CONSORT statement: Revised recommendations for improving the quality of reports of parallel group randomized trials. JAMA 2001;285:1987-91. 109. Altman DG, Schulz KF, Moher D, Egger M, Davidoff F, Elbourne D, et al. The revised CONSORT statement for reporting randomized trials: Explanation and elaboration. Ann Intern Med 2001;134:663-94. 110. Kumar SP. Sorting out lemons and ranges: Towards better quality of reporting clinical trials in Journal of Physical Therapy- the CONSORT 2010 statement. J Phys Ther 2010;1:1-10. 111. Moher D, Jones A, Lepage L. Use of the CONSORT statement and quality of reports of randomized trials: A comparative before-and-after evaluation. JAMA 2001;285:1992-5. 112. Zarin DA, Young JL, West JC. Challenges to evidence-based medicine: A comparison of patients and treatments in randomized controlled trials with patients and treatments in a practice research network. Soc Psychiatry Psychiatr Epidemiol 2005;40:27-35. 113. Hopewell S, Dutton S, Yu LM, Chan AW, Altman DG. The quality of reports of randomised trials in 2000 and 2006: Comparative study of articles indexed in PubMed. BMJ 2010;340:c723. 114. American Society of Clinical Oncology. American Society of Clinical Oncology policy statement: Oversight of clinical research. J Clin Oncol 2003;21:2377-86. 115. Keeley PW. Improving the evidence base in palliative medicine: A moral imperative. J Med Ethics 2008;34:757-60.